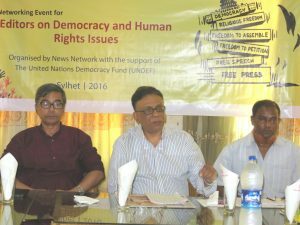 On June 2, 2016 News Network met with editors, executive editors and news editors of newspapers in Sylhet to discuss the role of the media houses in promoting democracy and human rights through in-depth reports, features and columns. 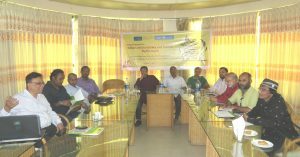 Shahiduzzaman, Editor of News Network and Farid Hossain, Dhaka correspondent of Time magazine conducted the session. Sylhet is a northeastern division of Bangladesh. y face in carrying out the task. They observed that local newspaper owners often focus more on issues that earn them advertisement revenues rather than highlighting the issues that affect their lives. So, they suggested holding similar dialogue with the owners. Lack of resources, logistic support and travel expenses have also been cited as reasons why media houses can’t send reporters to remote villages to report on violation or upholding of democratic and human rights practices. © News Network 2016. All rights reserved.